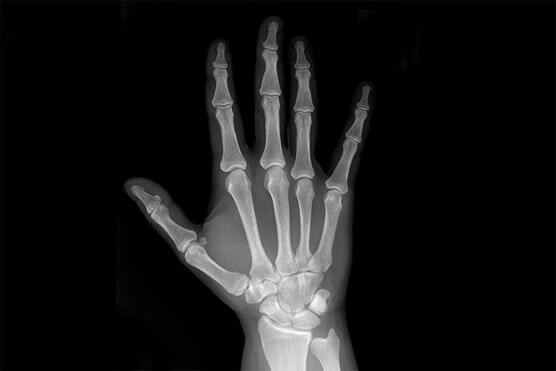 An X-Ray (radiograph) is a technique that uses low dose radiation to create pictures of bones and other internal tissues such as your lungs and bowel. High Street Xray uses state of the art digital X-Ray equipment, resulting in a reduced amount of radiation for excellent image quality. A basic X-Ray does not require any special preparation. Metal objects such as watches, keys, coins and jewellery will show up on the X-Ray, affecting the images and therefore may need to be removed. You may be provided with a gown to wear instead of your own clothes, as some materials and prints will show up on the X-Ray. You will be asked to stand or lie down in different positions that allow the best images of the body part of interest. During the X-Ray, you will be asked to remain as still as possible or hold your breath in order to improve the quality of the images. As is the case with a regular photograph, anything moving will appear blurry and may require the X-Ray to be repeated. An X-Ray will only take a few minutes for each body part. Are there any after-effects from an X-Ray? There are no after-effects from a general X-Ray. You will be able to go about your normal activities immediately after your X-Ray is completed. What are the risks of an X-Ray? Having an X-Ray will expose your body to a very low level of radiation. Health experts feel that the risk to your health from this is very small, and your referring doctor will weigh this low risk against the test’s benefits. No radiation remains in your body after the test. If you are pregnant or think that you may be pregnant, tell your doctor and High St Xray staff, as X-Rays can potentially affect an unborn baby. Who does the X-Ray report? The person who operates the X-Ray equipment is a Radiographer. The person who views the X-Ray images and then interprets them and creates a diagnostic report is a Specialist Doctor called a Radiologist. The High St Xray Radiologist provides the written report to your referring practitioner which is then sent electronically or faxed immediately.